KTLA-TV has closed the voting on a poll to select the best band in the 2011 Rose Parade, and the Western Carolina University Pride of the Mountains Marching Band finished with 72,287 votes – 40 percent of all votes cast in the poll and the most of any of the parade’s musical groups. Visit the station’s web site to watch video of the WCU band or to see the results of the poll. Thanks to Western North Carolina media outlets for helping get the word out about the poll and encouraging the band’s fans to exercise the right to vote! As for the Pride, most members flew home from California on Monday, Jan. 3. Meanwhile, the volunteers driving the trucks with the band’s equipment began the cross-country journey back. The drivers again faced snowy weather – even in the desert – and were making their way across Texas on Tuesday, Jan. 4. The trucks are scheduled to be unloaded on campus in a few days. 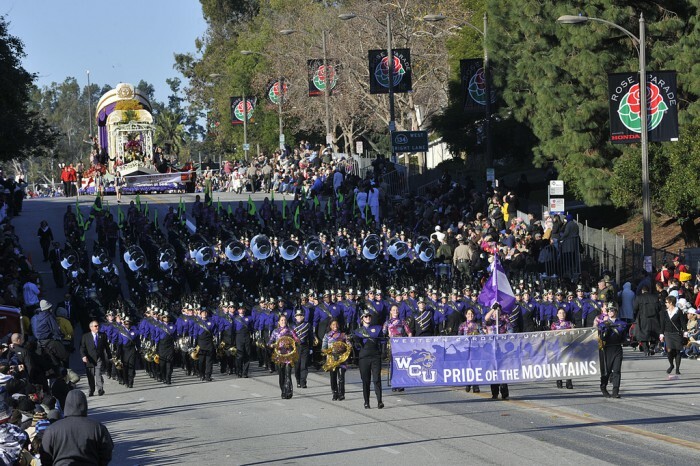 To learn more about the Pride’s experience in Pasadena, check out posts at roseparade.wcu.edu, including a collection of comments from band members and fans about the parade, features about band members, comments from the band’s banquet, and features about band sponsors and supporters such as music arranger Bill Locklear. In addition, the site hosts videos, including video of a drummer giving his drumsticks to a parade-goer. Also, roseparade.wcu.edu has nearly a dozen slideshows, featuring photos from the band taken from a media stand on the parade route to the warm reception the members received upon their arrival back at the hotel. There’s more, too. Check out the site’s archives. T-shirts: About 10 gray Pride to Pasadena T-shirts (two size medium, four size large and two size 2X) were still available from Catamount Clothing & Gifts as of Tuesday, Jan. 4. Because of low supply, the shirts are not listed on the store’s website. To inquire about purchasing a T-shirt for $15, call 828-227-2886. Coming Soon: A feature to appear in the next issue of The Magazine of Western Carolina University will offer even more video features and photos from the Pride to Pasadena. Thanks for your interest in the Western Carolina University Pride of the Mountains Marching Band. For additional information, contact the WCU Office of Public Relations at 828-227-7327.